Alannah Pawlik, Media Manager, Conagra Brands, rather casually described the company’s consumers as “anybody who has a mouth or a stomach,” which, by its reaction, the audience chucklingly agreed with. She spoke on Wednesday morning at MediaPost’s TV & Insider Summit in Scottsdale, Arizona, about Conagra’s evolving strategy. It is shifting away from its long attachment to TV and commercials that Boomers, especially, remember from the 1960s -- Chef Boy-ar-dee being one great example. 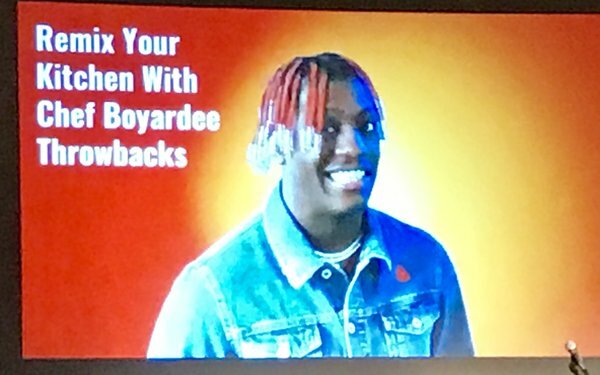 Once a minute-long commercial showing hordes of kids running through the streets demanding the product, Conagra now is out with retro 15-second bits involving Donny Osmond and Little Yachty (seen above), to capitalize on the cultural trend of nostalgia. The company is trying to be as personalized as it can be with its message. Take Healthy Choice, for example. The innovation last year was Power Bowls, she said, with modern attributes like vegetarian bowls. “You may want to eat a Healthy Choice Power Bowl because you’re on a low-carb diet or a weight-loss journey,” she said.